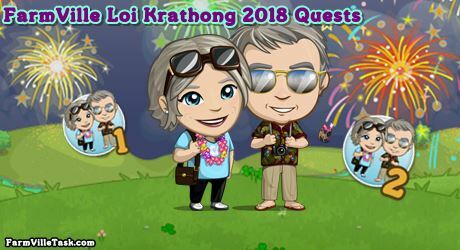 Paul and Linda is visiting us once again to enjoy a fun filled day in FarmVille Loi Krathong 2018 Quests. The couple ask us if we could help them plan the best way to spend a fun filled day. We plan the best itinerary by gong to different travel agencies. On this FarmVille Quests, we are going to craft 9 recipes at the BAKERY, SPA and WINERY. Collect the bushels early and save them so that you will be ready once the quests calls for it. Note: Expected to be release on Thursday (November 22nd). Info: Crafted at the WINERY. Info: Crafted at the SPA and will need Blueberry Bushel x4 and Morning Glory Bushel x4. Info: 18 hours to grow and harvest. Info: Crafted at the BAKERY. Quest Handicap: 150 – 135 = 1 amount to harvest. Info: Crafted at the SPA. Info: Crafted at the SPA . Info: 2 days hour to grow and harvest. Info: Crafted at the WINERY and will need Blackberry Bushels x3, Grape Bushels x1 and White Grape Bushels x3.